Why did you have to go up and delete a lot of my recently uploaded photos of food? I know you decided to upgrade to the 3.2 version and you probably have some new features that I will probably never use but seriously? What did I ever do to you? Because of you, I am not unable to bring the goods to my adoring (you adore me, right) fans. No maple walnut apple crisp. No rosemary pear cast iron pan cake. Basically, Aperture, right now you are the grinch of the town called The Ginger Cook-ville and I'm none too happy about it. I am completely vented and ready to move onto discussing two of my favorite thing: Glee and pizza. I've mentioned before how, every Tuesday night, my closest Seattle girlfriends and I cook dinner at Katrina's house and watch Glee. Food, show choir and 27-year olds trying to pass themselves off at high schoolers. That is a snapshot into the secret life of the 20-something female people. Do you also remember that I said I would start bringing my camera? I finally did AND I even was able to play cheesy 1970's British photographer with Julie in the backyard while taking some head shots. What I'm basically trying to say is that we're the classiest bunch of ladies you would ever hope to meet. Julie suggested we make a vacation of her favorite pizza at Proletariat Pizza in White Center. I made my usual half whole wheat thin crust recipe earlier in the day and other ladies were in charge of different ingredients. 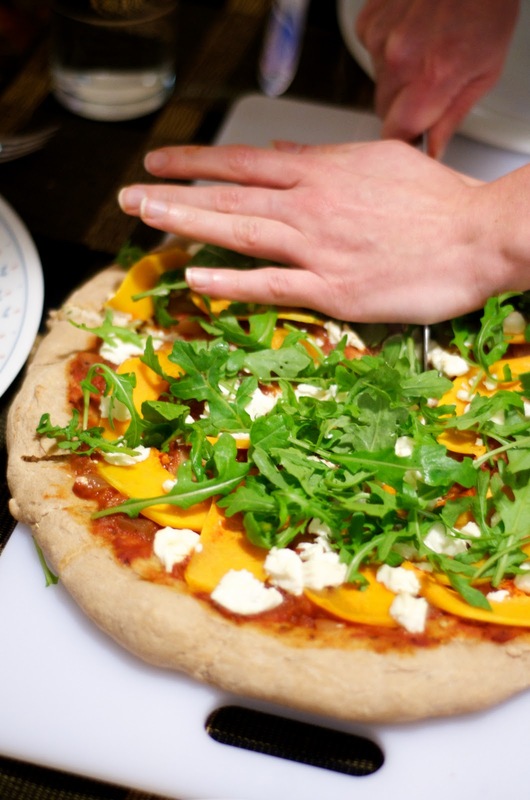 It's your pretty basic pizza except for that it is topped with shaved butternut squash and loaded with arugula right after it is taken out of the oven. That my friends, is the key to a perfect fall pizza. I must warn you though, this recipe will also probably appear in another location hopefully very soon. 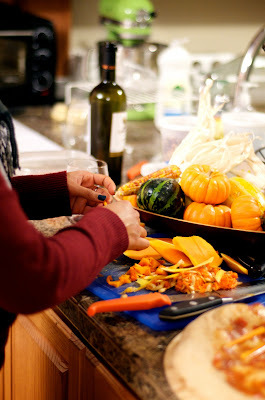 We're planning to develop our weekly cooking adventures into the greatest collaborative blog that has ever existed! Mix yeast, sugar, and warm water. Stir gently until combined and no clumps remain. Let mixture sit for about 5-10 minutes. Add flour, oil, garlic, herbs, and salt, beating in with a spoon. Using your hands, gently push the dough together until it forms into a ball. Kneed for 2-3 minutes. Brush a thin layer of olive oil over the dough and cover with Saran wrap. Let it sit and rise in an oven heated to 100 degrees for about an hour (it only took me 45 minutes), or until doubled in size. When your dough is ready to go, you can do one big pizza or two pizzas and roll until it is thin. Transfer the rolled dough onto a cookie sheet coated generously with olive oil. Brush a generous amount of olive oil on the top of the dough. 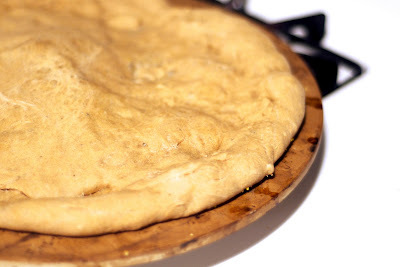 Make sure that all parts of the dough is covered in olive oil- both top and bottom. (If it's not completely coated, you won't get an even golden and crispy crust). Poke the dough a few times with a fork (this prevents the dough from bubbling up while in the oven). Bake at 425 for 12-15 minutes, or until the crust is golden brown. 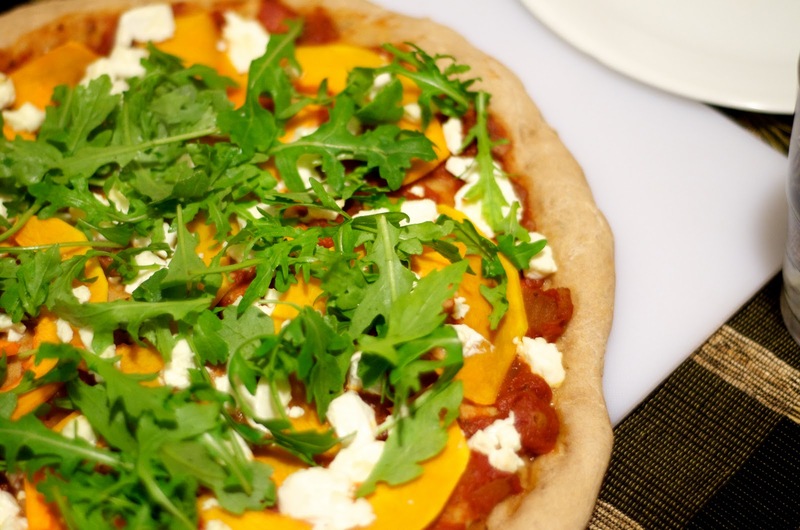 Top with your sauce of choice (we used Avanthi's homemade red sauce), shaved butternut squash and goat cheese. Bake the topped pizza in the 425 degree oven for about 7-10 minutes, or until the cheese melts. Top with arugula right after removed from the oven and wait a few minutes until you cut into it. I just bought butternut squash at the market the other day, any suggestions/recipes for butternut squash soup (with a vegetable stock) ? Kelsy - I'll email over a recipe EOD!